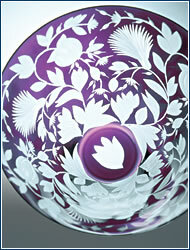 The American Karen Feldman is enriching traditional, elegant crystal cutting with fresh playfulness and perspective. 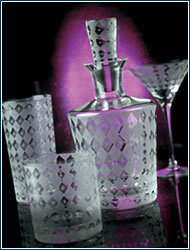 She produces Czech glass as assuredly and easily as if she had generations of experience behind her. 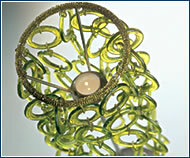 WHEN SHE MOVED to Prague in 1994, she didn’t know much about Czech glass, but she knew what she liked. 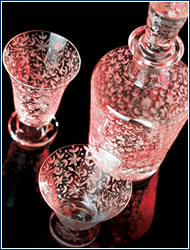 “At that time I was discovering the lovely glass in Prague’s antique shops. 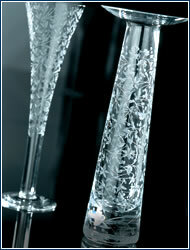 I had a specific notion of a glass I would like to buy, but I couldn’t find it anywhere. So I decided to have someone make it for me,” she says, describing her first impulse to go into business. Feldman dreams up and designs the basic artistic ideas, then she brings in designers who know the specifics of crystal cutting. 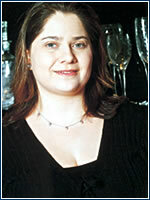 Her style can be summed up as classic with a modern concept – elegant, tasteful, enriched by unexpected, playful motifs. “Inspirations can come from an old postcard, a piece of textile, glass, or a motif from a children’s book,” says Feldman. For now you can find Artěl’s products only in the Modernista gallery, but they will soon be available in the Four Seasons hotel as well. “In fact we’re focused on exports. We sell our products at Harrods in London, Barneys in Japan, and Le Bon Marché in Paris.” Whoopi Goldberg, the American presidential candidate John Kerry, and the fashion designer Marc Jacobs are among those already drinking from Artěl glasses. While spring euphoria lasts, stock up on optimistic items for a rainy day. You won’t get very much light from this ring-shaped lamp and tea candle, but your interior will take on a distinctive style. 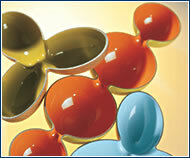 Original plastic bowls by Robex are an ideal economical solution for a three-member family or a team. 400 a 540 Kč, Luis. 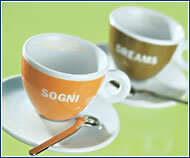 Wake up from your winter reveries with a jolt of espresso. 396 Kč, Potten & Pannen. 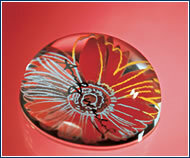 A floral paper weight with an Andy Warhol motif. 1329 Kč, Potten & Pannen. IN THE ABITARE INTERIORS STUDIO you can furnish your apartment in high Italian style, but the specialties might grab your attention even more. Fall in love with enchanting doll house rooms by Mibb or, for more experienced tastes, there’s the original collection of Bugati and S’Oliver bed linens, sophisticated decorative fabrics, stainless bathroom accessories, pottery, or popular Kahla porcelain.